It probably is hard to imagine Toa Payoh holding a reputation for being a hotbed of criminal activity – so much so that it was labelled as the “Chicago of Singapore” – a reference to the US city’s long-held reputation as the crime capital of the world. While this reputation had its origins in the squatter settlements in pre-public housing estate Toa Payoh when the rural setting made it possible for gangsterism to thrive such that few from the outside dared to venture in; its reputation stuck with its name well into the first decade of its new life as the first Housing and Development Board (HDB) planned satellite town. While much of Toa Payoh’s reputation did have its roots in the gangland activities that did go on, it wasn’t so much the incidents involving Toa Payoh’s gangsters that were perhaps most visible but those that did involve individuals or small groups of criminals in Toa Payoh. 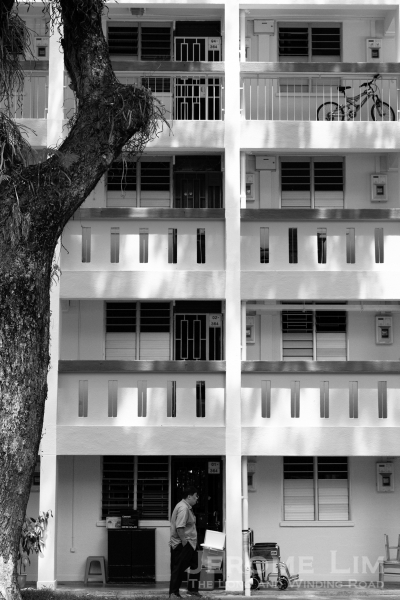 One of the Toa Payoh’s most famous crimes, the ritual murders committed in a Toa Payoh flat by Adrian Lim and his accomplices in 1981, happened well after the satellite town had in fact shed its reputation. It was well before that incident however that another that had the makings of a Hollywood style shootout, made the headlines in 1970, when Singapore’s second most wanted man, Tan Chiang Lai, found himself cornered in a flat in Lorong 5. Tan, who was also known by a nickname “Hun Cher”, was being hunted down by police after he had shot and killed a watch dealer and proprietor of Thim Lock Watchmakers, Mr Fong Tian Lock in an attempt to rob Mr Fong’s North Bridge Road shop for which Tan and his five accomplices made away with just seven watches. The robbery on 17 July 1970, was one of a series of armed robberies over a period of two months that Tan had been involved in, starting with a robbery of a shopkeeper of $4200 at Chulia Street on 6 June 1970. The list of robberies also involved a provision shop in Tanjong Pagar, gamblers in a house at 9th Mile Changi Road, the Golden Ringo Nightclub at Outram, and a gambling den in Lorong K Telok Kurau. Constantly on the move to avoid being caught, the Police finally caught up with him and an accomplice Sim Thiam Huat on 27 July, when in a desperate search for accommodation they fell for a trap that was laid by the police when they moved into a police detective’s flat in Block 64 Toa Payoh. Having cleared the flats around the fourth storey unit of their occupants, the police had the flat surrounded late in the night and with the help of teargas grenades, they attempted to flush the two out just past midnight. Sim surrendered after being bundled out by Tan from the flat’s balcony at its rear. Tan himself chose not to surrender, shooting and killing himself, bringing to an end to his short but violent career in armed robbery. Sim, who was also Tan’s best friend, was sentenced to six years in jail and six strokes of the rotan in August 1970 for the role he played in the Outram Park robbery and a concurrent sentence of five years in jail for the Tanjong Pagar robbery. There were to be several more incidents involving gunmen, including one the culminated in a showdown at a cemetery in Jalan Kubor in December 1972 and another involving the most wanted man, Lim Ban Lim, who was shot dead in a shootout at Margaret Drive in November 1972, having been on the run for nine years. The spate of violent robberies in the early 1970s led to the harsher penalties being introduced for gun offences. The new laws, introduced in 1973, stipulates a mandatory death penalty for anyone using or attempting to use a firearm to cause injury – this did seem to work and by the time Toa Payoh had shed its long time crime tainted image as the 1970s drew to a close, gun related offences did also appear to be on the wane. One of these units at Block 64 in Toa Payoh was where Hun Cher took his life early one July morning in 1970.